Professor Samuel P. Langley was one of the first major aeronautical figures in America. 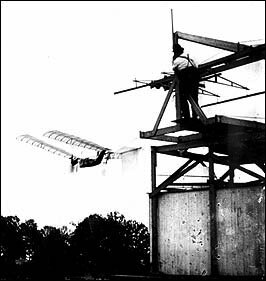 In 1892 he began experimenting with large models powered by steam engines, and on May 6, 1896, his "Aerodrome #5" made the first successful flight of any powered flying machine. Two flights of about one-half mile each were made that day and on both flights the aircraft climbed and turned with ease. In 1903 Langley attempted to fly a much larger man-carrying aircraft along the same lines, but this failed dramatically on two occasions. The two most important engineers in Langley's experimentation were Charles Manly and Augustus Herring, both Freeport residents.